Award winning, SQUIRREL! 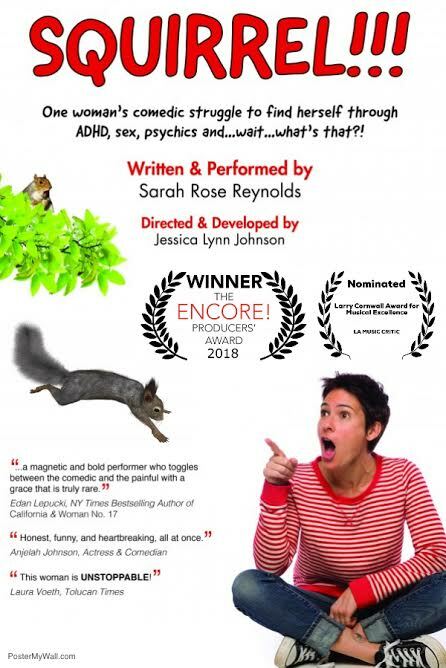 follows a quirky, nutty girl as she fearlessly confronts her battles with ADHD, while facing the unbearable challenges of adulthood. Playwright Sarah Rose Reynolds takes the audience on a humorous (and sometimes painful) journey as she grapples with her sexuality, career decisions, and turning to psychics for all the answers. The show previewed in SoloFest 2018 at the Whitefire Theatre and then enjoyed a successful run at the Hollywood Fringe Fest 2018. Every show SOLD OUT. It was the proud Winner of the Encore Producers Award and Nominated for the Larry Cornwall Award for Musical Excellence! Catch SQUIRREL as part of the SOLO QUEENS FESTIVAL at BOOTLEG theatre.